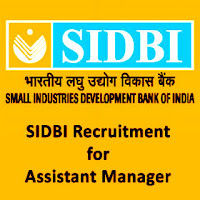 Small Industries Development Bank of India (SIDBI) invites online applications for filling up 100 vacancies of Assistant Manager on permanent basis. 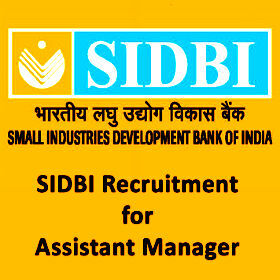 Candidates complying with required eligibility criteria may apply online application from 21-12-2015 to 11-01-2016. Before applying you must read carefully all the information about eligibility criteria and other norms. Applicants must have scanned copies of their passport size colour photograph and signature Before applying online. Selecation will be based on online examination and personal interview. Application fee is Rs.50 for SC/ ST/ PwD and Rs.500 for General & OBC candidates is to be paid by online by using Internet Banking,Debit Cards, Credit Cards, Cash Cards/ Mobile Wallets. Interested candidates with required eligibility may apply through online system from 21-12-2015 to 11-01-2016. Before filing online application, candidates must make ensure themselves that they fulfill eligibility criteria and other norms. Applicants keep ready their scanned copies of passport size colour photograph and signature before applying online application. Applicants are advised to carefully fill and verify the details filled in the online application. After registering online candidates are advised to take a printout of their system generated online application forms and keep for future use only.